Pictures & images of Hagia Sophia ( Aya Sophia ) Basilica Istanbul. Completed in 537 for Roman Emperor Justinian, Hagia Sophia is a major Roman Byzantine work of architecture with a massive dome that would not be surpassed in size for 1000 years. 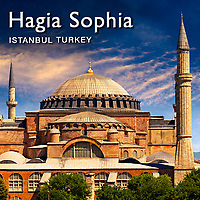 The present Hagia Sophia or church os the Holy Wisdom, is the third Basilica to stand on this site. The size of Hagia Sophia is awe inspiring even by modern standards and the mathematics used to create such a vast dome demonstrate how sophisticated ancient mathematicians & engineers were. The main dome though collapsed completely during an earthquake on 7 May 558. It was rebuilt with lighter materials and 30 feet higher by Isidorus the Younger, nephew of Isidore of Miletus and today stands at 55.6 metres (182 ft). Hagia Sophia was the Church of the seat of the Orthodox Patriarch of Constantinople and was decorated inside with Roman Byzantine mosaics with gold backgrounds that would have made for a spectacular interior. The Fourth Crusade (1202-1204) took and sacked Constantinople and most of the treasures and relics from Hagia Sophia were looted by the Venetians who used took them back to Venice to adorn the Basilica of Saint Marks. In 1453 Sultan Mehmed took Constantinople and the treasures of Hagia Sophia were again pillaged. The Basilica became a mosque and its design was the benchmark for all the great mosques that were subsequently built. Over time the Christian mosaics, that were seen to idolatrous by Muslims who do not allow depictions of Saints or God, were replaced with Islamic designs. Aya Sophia became first imperial mosque of Istanbul. After the creation of an independent Turkish state, in 1935, the first Turkish President and founder of the Republic of Turkey, Mustafa Kemal Atatürk, transformed the building into a museum. Plaster removed to reveal some of the Roman Byzantine mosaics that survived underneath. Today it is part of the UNESCO World Heritage Site that incorporated Ancient Istanbul.